The United Nations and its partners plan to deliver much-needed relief assistance to the besieged Syrian enclave of eastern Ghouta this week, the global organization’s humanitarian wing said on Sunday. A convoy of 46 trucks carrying health and nutrition supplies, along with food for 27,500 people, should arrive in the city of Duma on Monday, the UN humanitarian affairs office, OCHA, has reported. “We hope that the convoy may proceed as planned and will be followed by other convoys. Our teams on the ground are ready to do all that is needed to make this happen,” said UN Resident/Humanitarian Coordinator in Syria, Ali Al-Za’tari. On 24 February, the UN Security Council unanimously adopted a resolution calling for a 30-day nationwide ceasefire in Syria, in addition to other measures including the lifting of sieges, particularly in eastern Ghouta. 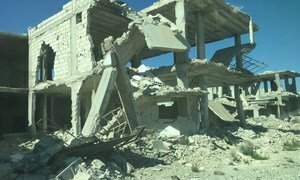 However, UN Regional Humanitarian Coordinator for the Syria Crisis, Panos Moumtzis, who is based in Jordan, noted that one week later there has yet to be a cessation of hostilities, while violence has escalated in some areas. “Instead of a much needed reprieve, we continue to see more fighting, more death, and more disturbing reports of hunger and hospitals being bombed. This collective punishment of civilians is simply unacceptable,” he said in a statement issued on Sunday. OCHA reported that the UN and partners have received approval to deliver assistance for 70,000 people in need in Duma. The UN has received assurances that the remaining supplies for all approved people in need will be delivered on 8 March, according to a press release issued by the UN office. So far this year, the only UN aid delivery to eastern Ghouta was on 14 February, when a convoy with supplies for 7,200 people reached the town of Nashabiyah. Meanwhile, the UN has called on all parties in Syria to facilitate unconditional, unimpeded, and sustained humanitarian access to all people in need throughout the country. The Syrian conflict began in March 2011 and has generated what has been described as the worst humanitarian crisis of our time. Despite the ongoing violence, the UN continues to provide millions of people in need with life-saving assistance on a monthly basis.